However, the Premier after his government invested $7.2 million of the territory’s tax payers’ money in starting up the airline, which has not commenced direct flights between the Terrance B. Lettsome International Airport and Miami International Airport, missing several deadlines, the Finance Minister fumbled and could not give a direct answer. He said, “I would not be able to tell you at this moment in time where the planes are located in America but I can get that information,” Premier Smith said during the Eleventh Sitting of the Second Session of the Third House of Assembly (HoA). Seeking more clarity from Premier Smith, Hon Fahie asked him to confirm if the two planes are in Canada and if they are not being released because his government has not paid for the refurbishment. “As I said earlier, I will be able to provide information as to where the planes are if that is the request, and I will provide it for you,” repeated the Minister of Finance. Hon Fahie during a follow up question asked the Premier what actions his government are taking to regain the $7.2 million given to BVI Airways, given that they missed the deadlines to fulfil the services that was agreed with government. “I will reiterate that BVI Airways is currently engaged with various entities in relation to investment in the project, so it would therefore be prejudice to further discuss it at this time,” urged the Premier. Meanwhile, in July there were conflicting information between the government of the day and BVI Airways. 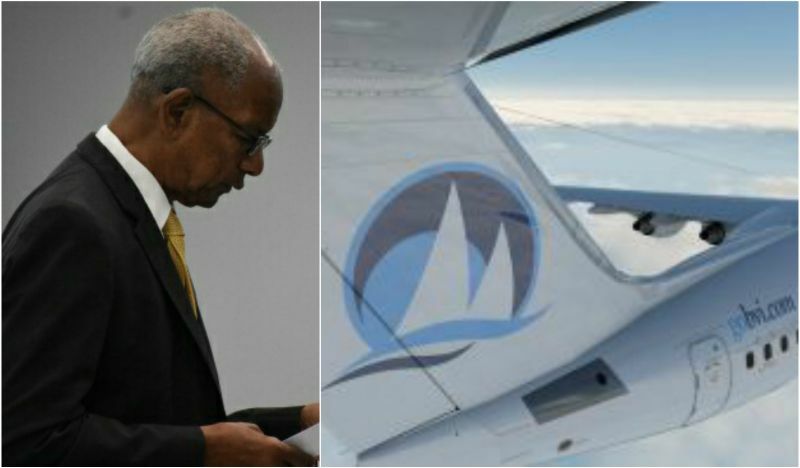 BVI Airways announced in a press release in July that it was dealing with major financial hiccups which forced them to let go of an entire flight crew. The airline laid the blame on the government for the setback for the direct flights between the Virgin Islands and Miami, but the government stated that it provided all the necessary monies to the airline. To this day, the government and the people of the territory are awaiting the commencement of the anticipated direct flights between the Terrance B. Lettsome International Airport and the Miami International Airport, in the United States of America. The one who wears the pants in the Doc house sitting pretty in this plane $$$. Less than this deal man going jail cor but these con man NDP getting away with our $$$$. All I can do is shake my damn head. What's next with Doc. The plane will fly when a horse grow wings and fly. What a waste of money. Big mistake Doc. You should have listen.A hard head makes a very soft behind. Sad,when you have time to spare go by air. Wow..he doesn't even know where the $7.2 million investment is?? And he trying take on attitude with Hon. Fahie. He don't know but he can find out? Find of from who, when, how, where are they? Where is the transparency??? Seriously though, either his advisor intentionally making him look bad or he needs to get an advisor. Please, someone help him out! Where is Waldo? Money down the drain. More value would have been gained if the $7.2M was thrown in the air and declared that what stayed belong to the taxpayers. What a waste of money; that $7.2M is needed now. PREMIER SMITH LET ME MAKE IT CLEAR TO YOU AND YOUR INCOMPETENT GOVERNMENT. YOU ALL HAVE UNTIL YEAR END 2017 TO FIND THOSE DAM AIRCRAFT WHERE EVER THEY ARE AND PARK THEM ON THE TURMAC AT T.B. LETTSOME INTERNATIONAL AIRPORT, SO THAT THE PEOPLE OF THESE VIRGIN ISLANDS CAN PRESENT TO THE BRATHWAITH BROTHERS AS THERE NEW YEAR PRESENT. THIS BS YOU CONTINUE TO ENGAGE IN, WE WILL NO LONGER ACCEPT PREMIER SMITH. My flight on BVI Airways is booked. They flying. Trust me. Doc promised The 7million will be returned to The BVI and it will . The louder you guys rant rather than reason listen and read, the shinier Doc and all of NDP will be when this chapter closes always. Long time I haven't heard anything from all the naysayers on their favourite topics, Pier Park and Peebles. Why. ?